Recently, The apex court in Pooja Pal vs. Union of India, directed the CBI, to conduct a de novo investigation in the incident of murder of Raju Pal, the slain BSP MLA, by allowing an appeal filed by his wife Mrs.Pooja Pal. Apex Court Bench comprising of Justices V. Gopala Gowda and Amitava Roy said that pendency of the trial and the examination of the witnesses so far made is not a disarming factor to consider the necessity of entrusting the investigation to the CBI. Supreme Court, on Thursday, reiterated that second complaint to a Consumer District Forum is maintainable, if relevant Consumer Protection Rules do not expressly prohibit it. Apex Court Bench of Justices Madan B. Lokur and R.K. Agrawal made this observation in Indian Machinery Company vs. M/s. Ansal Housing & Construction Ltd. In a judgment delivered on Thursday, a Division Bench of the Supreme Court has held that once liability and consideration were proven by the endorsement made on the Promissory Note, it cannot be contended that the cheques were issued merely as security. The Bench, comprising Chief Justice T.S. Thakur and Justice Kurian Joseph, hence ruled that the offence under Section 138 of Negotiable Instruments Act, 1881 was proven and set aside the judgment delivered by the High Court. The Supreme Court on Thursday, reiterated the settled principle of law relating to power of attorney, that any document executed or thing done by an agent on the strength of power of attorney is as effective as if executed or done in the name of principal, i.e., by the principal himself. A two Judge Bench of the Supreme Court in Dharam Pal v. State of Haryana held that an Investigation by another agency including CBI can be ordered by the Constitutional Court even after commencement of Trial. Supreme Court on Friday, held that State would not be estopped from altering/modifying the benefit of concessional tariff. Three Judge Bench of Apex Court comprising of Justices Ranjan Gogoi, Arun Mishra and Prafulla C. Pant made this observation in M/s. Kothari Industrial Corporation Ltd. vs. Tamil Nadu Electricity Board. Supreme Court has observed that the terms of the contract, especially Arbitration agreements will have to be understood in the way the parties wanted and intended them to be. 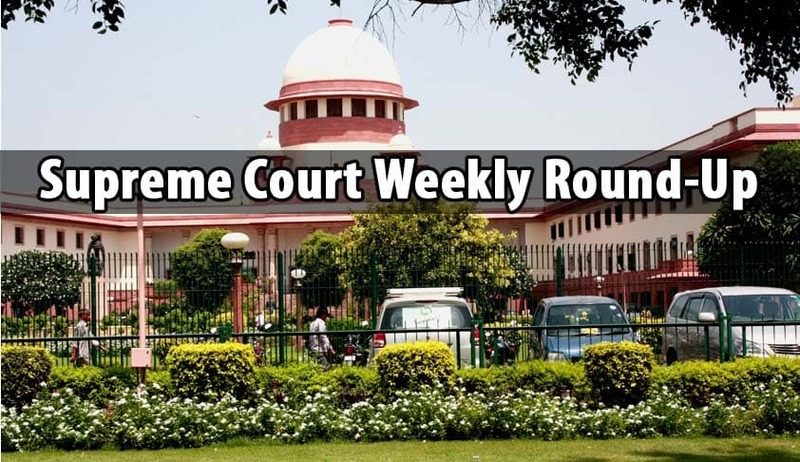 Apex Court Bench comprising of Justices Anil R. Dave, Kurian Joseph and Amitava Roy made this observation in Bharat Aluminium Company vs. Kaiser Aluminium Technical Services Inc.
Kindling a ray of hope in the minds for lakhs of nurses working under pitiable conditions, the Supreme Court on Friday asked the Centre to set up within four weeks an expert committee to look into grievances pertaining to service conditions of nurses employed with private hospitals and private nursing homes across the country. The Apex Court, headed by Chief Justice Tirath Singh Thakur has approved appointments to the High Courts of Madras, Chhattisgarh, Karnataka, Allahabad, Kerala, Madhya Pradesh and Bihar. The Law Ministry has reportedly started working on the procedure of appointment of these candidates. The Supreme Court on Wednesday, issued notice to the Centre and Arunachal Pradesh Governor J P Rajkhowa on a petition challenging the imposition of President’s rule in the state on the ground that there was a failure of constitutional machinery. Recalling its December 16 order appointing former Allahabad High Court judge Justice VirendraSiingh as the Uttar Pradesh Lokayukta finding it “somewhat inaccurate”, the Supreme Court on Thursday, made a new appointment and slammed the state government for creating a confusion by not placing the state Chief Justice D Y Chandrachud’s opposition to the choice of Singh in time before it passed the earlier order.